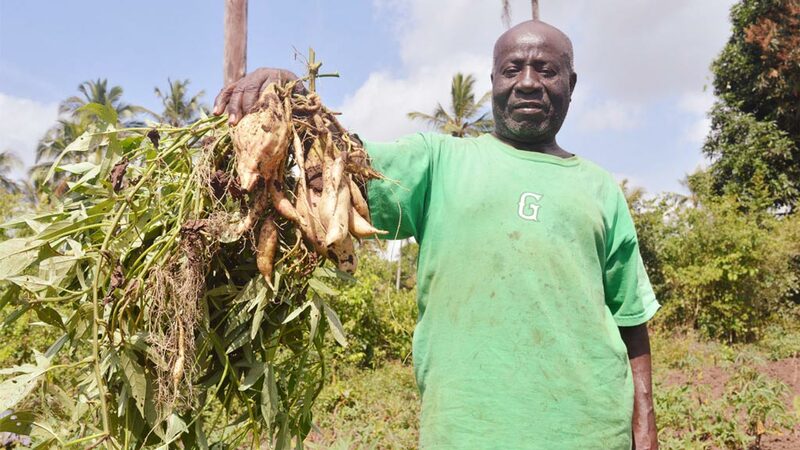 Four months after planting 102 trials for the Cassava Intercropped with Sweet Potato (CIS) project in the Islands of Unguja and Pemba, Zanzibar in the United Republic of Tanzania, ACAI and implementing partners in Zanzibar, ZARI, has begun harvesting potatoes from the trial fields. Khatib Haji and Seif Ali Masood from ZARI, collecting data from harvested samples at Matangatwani Trial Farm, Pemba Island, Zanzibar. Photo: Ngome – IITA. Under the auspices of IITA, ZARI in collaboration with Farm Concern International (FCI) has been carrying out the potato harvests from 22 August until the second week of September. The successful harvest will be the first CIS trial harvest in Zanzibar since the project began. The initial 2016 trial harvest was not carried out after bad weather conditions resulted in stunted crop growth and hampered root and tuber formation. ZARI’s head of Roots and Tuber Research, Dr Haji Saleh says the 2017 season has shown robust growth developing under better weather conditions. “We are expecting to harvest something this season based on visual evidence as opposed to the previous season,” says Saleh. The CIS trials were set up to evaluate the performance of cassava when grown alongside sweet potatoes under different plant densities for the two crops to establish the optimum density for the intercropping, and to observe the effect of additional nutrients and different planting times in introduction of sweet potatoes. The trials used varied densities of sweet potato at high to lower density (10,000, 20,000 and 33,000). Planting periods were also spaced between planting the two crops simultaneously and introducing sweet potatoes at 2 weeks after planting (2WAP) cassava. Other treatments include fertilizer application and no fertilizer for other plots in the same trials. ACAI in partnership with ZARI set up 102 CIS trials at ZARI stations in Kizimbani on Unguja Island and Matangatwani on Pemba Island and in selected farmers’ field trials. Veronica NE Uzokwe, ACAI’s agronomist in Tanzania, expressed optimism on the trial performance of the 2017 season trials. “We are noticing that in cases where sweet potatoes were introduced later the plants look more robust and healthy than in cases where they were planted together,” Uzokwe said. Sweet potato is a key cash and food crop for smallholder farmers in Zanzibar. In both Unguja and Pemba districts of Zanzibar, sweet potato is most commonly intercropped with cassava according to ACAI. Farmers in Zanzibar face scarcity of arable land, unfavorable and unstable weather conditions, and pests which result in poor yields. ACAI is developing a cassava intercropping decision support tool to prescribe the best planting times, a period of introducing sweet potatoes in cassava planted plots, optimal density of intercropping, and using appropriate fertilizer application. Mikakani Imara Women group members with ACAI team at the group’s farm where ACAI is running CIS trials in Unguja, Zanzibar. Photo: Ngome – IITA.